Bake brownies as directed on the box. Cool completely. Meanwhile, in a large, deep and heavy skillet, cook sugar over medium-high heat, stirring constantly with a heatproof rubber spatula until sugar is melted and turns a deep golden caramel. Remove skillet from heat and add chunks of butter one by one, whisk until combined. The caramel will bubble, this is okay. Slowly add the cream and continue whisking until combined. Return pot to heat and cook the mixture over medium heat, stirring until caramel has thickened, about 3-5 minutes. Remove from heat, add the bourbon (if using) and a pinch of salt. 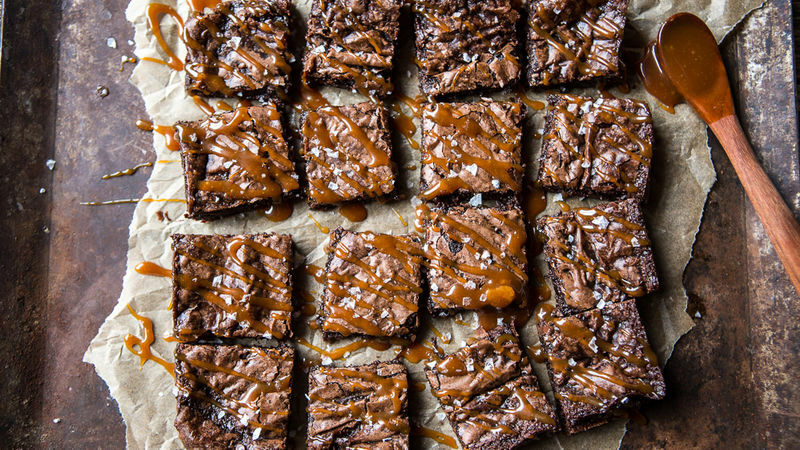 Slice into bars and drizzle with bourbon caramel. Sprinkle with flaky sea salt. Eat! This recipe will also work with any of your favorite Betty Crocker™ brownie mixes. Try stirring in walnuts or your favorite candy to make the brownies even more decadent!